It is common knowledge that smoking is bad for your overall health. It can lead to many serious medical issues including cancer and other fatal diseases. However, many people don’t realize the serious damage that smoking causes in their mouth, gums, and teeth. Smoking can lead to tooth staining, gum disease, tooth loss, and even mouth cancer. How will smoking affect my dental health? The nicotine and tar in tobacco causes severe staining of the teeth. Within a very short period of smoking, teeth will turn a yellow color. After prolonged periods of heavy smoking, teeth will eventually turn brown. Smoking cigarettes leaves smoke particles in the throat and lungs. This effect is typical of nearly any tobacco product that involves inhaling smoke in the mouth. The smell of a freshly smoked cigarette can linger in the lungs for hours, causing the stale scent associated with smoker’s breath. Smoking can also cause gum disease. People who smoke are more likely to produce bacterial plaque, which leads to gum disease. Smoking restricts oxygen from flowing into the bloodstream. The lack of oxygen prevents infected gums from properly healing. As a result, people who smoke have more dental plaque, which leads to gum disease that can never heal. This gum disease can lead to eventual tooth loss. The smoking or chewing of tobacco is the cause of 80–90% of oral cancers. Some of the chemicals contained in tobacco smoke cause, initiate or promote cancer. These chemicals cause genetic changes in cells of the mouth cavity, which can lead to the development of oral cancer. Treatment for oral cancer often involves surgery and radiation therapy. Surgery involves the removal of the cancerous tissue and if the cancer has spread to the jaw, part of the jawbone may also be removed. This may change how the face looks and the ability to chew, swallow, or talk. 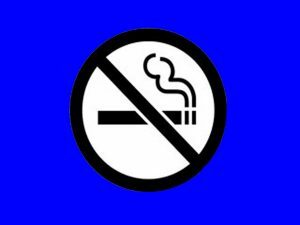 Longmeadow Family Dental Care welcomes all patients to our practice, whether you are a smoker or non-smoker. If you or a loved one needs an oral examination or procedure done to restore your dental health, make an appointment today with your Longmeadow dentist. Nearer the middle line of the body or the surface of a tooth nearer the center of the dental arch.